Satellite TV systems are commonly run as an additional service to terrestrial TV, or as a complete alternative for properties that struggle to receive a reliable terrestrial signal from their location. 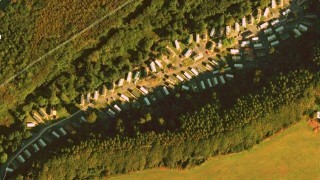 A satellite dish is capable of receiving Sky, FreeSat or foreign TV services. 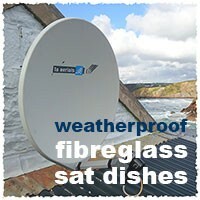 Commonly referred to as a ‘Sky’ or ‘Mini’ dish and supplied as standard with Sky or Freesat retail packages. 44cm x 30cm and made from powder coated steel. Those on a modest budget can rely on this satellite dish to provide decent signal when fixed securely in position and with connecting cable routed neatly to the TV point. These dishes are however, susceptible to interference during bad weather and can rust within 1-2 years if heavily exposed to the sea air. A professional satellite dish with improved shape and increased diameter. 65cm x 60cm and made from galvanised steel before being powder coated, providing a slightly longer life than the standard ‘Sky’ dish. The larger surface area of the dish catches more signal, providing higher gain and more reliable reception in bad weather. They are also less susceptible to interference from other satellites. A high quality, weather resistant and rustproof satellite dish that will last significantly longer than the budget or mid range versions. The dish is 65cm x 60cm and made entirely from fibreglass. Its aluminium arm and galvanised steel back plates ensures the complete product is fully sealed to resist wind and moisture of challenging levels. Read more about fibreglass dishes here. 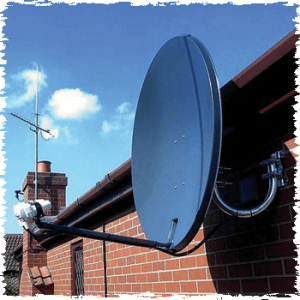 We also specialise in dish maintenance and repair (including motorised dishes), links to additional rooms and non-UK / foreign TV channels (Western & Eastern Europe and the Middle East) – give us a call for more details on 01437 711 142. 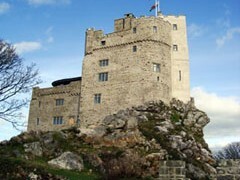 NB: Prices quoted cover a standard satellite installation on a property of up to 2 storeys. Price includes supply and fit of the satellite dish, wall bracket, quad LNB and up to 15 metres of cable routed neatly to the internal TV point.